I finally convinced someone to drive out to Starved Rock State Park with me to go for a hike. No surprise – it was Daniela. Now, I wasn’t entirely sure what to expect from a state park, but I was prepared. I pretty much wore the same outfit I had on hiking through the Andes Mountains in Peru. Sporty pants, hiking boots, a sweatshirt, weather-proof jacket and my backpack complete with snacks and a water bottle. How does Daniela show up at my house? Wearing jeans, a pea coat and with her Coach purse. At least she did have gym shoes on. Admittedly, once we were actually on the trail, we did see a lot of people wearing jeans and some girls just wearing their fall boots, but personally, I’d err on the side of preparedness. The drive to the park ended up being not bad at all. Especially since we made an impromptu stop at Andrea’s in Woodridge on the way. There, Daniela was convinced to at least ditch the peacoat for a Northface-style sweatshirt. We arrived at the Visitor’s Center, which was really easy to find, and got a map with a suggested route. I asked the older gentleman behind the desk if there was somewhere for us to sign in so they’d know if we went missing, but he said there wasn’t. We headed out on the trail and our first stop was Starved Rock itself. This is an awesome place to start. After a relatively short climb, you end up on a cliff that overlooks the entire park. I was thrilled to see plenty of fall colors still in effect! Next up, we took the trail to French Canyon, which was a really beautiful canyon you could actually walk into. You could imagine just how gorgeous this park is when the waterfalls are flowing, but unfortunately, everything was dried up during our visit. I did read that in winter there are icefalls sometimes, so I imagine spring is the prime time to see the canyons full of water? The day ended up being perfect for a hike. It was chilly but not cold, and there was a soft early afternoon sunlight. Coming out of French Canyon, we continued along the path to Pontiac Canyon, which was a more wooded, hidden canyon you walk along the edge of. That took us to Wildcat Canyon, an impressive canyon you could look down on from a platform or walk into below. Admittedly, I thought Starved Rock State Park would have been bigger and more wild. It is big, but not quite as in the middle of nowhere as I had imagined. While there were areas of the trail filled with families and other hikers, we also had a lot of quiet moments to take in the quiet atmosphere of the park with no one else around. And ultimately, by the time we finished our hike my muscles felt like rocks and I was exhausted…. and we had only gotten through half of the park, according to my map! As we passed through a couple smaller canyons, we reached the last two stops on our route before turning back – LaSalle Canyon and Tonty Canyons. These ended up being my favorites. The path to LaSalle Canyon winds around what I’m sure is a river when there’s water, and you walk along these steep hills of trees and then along sandstone cliffs that rise up around you. We walked into the canyon and there was even a tiny bit of water still trickling down from overhead. Tonty Canyon was just around the bend. It was surrounded by tall walls of stone, and had a pool of still water at its base, almost camouflaged by leaves. The sun shone down into the canyon creating picturesque rays of light through the colorful leaves. Our route had us making a loop around half the park, so after Tonty Canyon it was time to head all the way back to the visitor’s center! The return path ran right next to the Illinois River. We had a couple last stops on the way back, all overlooking the river, including Sandstone Point Overlook, Beehive Overlook, Eagle Cliff Overlook and Lover’s Leap Overlook. They all offered amazing views, but at this time I was almost too exhausted to fully enjoy them! Looking back west towards Starved Rock…so far away! Overall, I really enjoyed the trip to Starved Rock State Park. It was a wonderful escape from the city and opportunity to surround myself with nature and get some fresh air. If you’re planning to go, definitely check out the website, which is surprisingly awesome for a state park. And here is a map of the hiking trails. While fall colors might be ending, winter is a great time for eagle watching in Illinois, so I just might head back there in January! 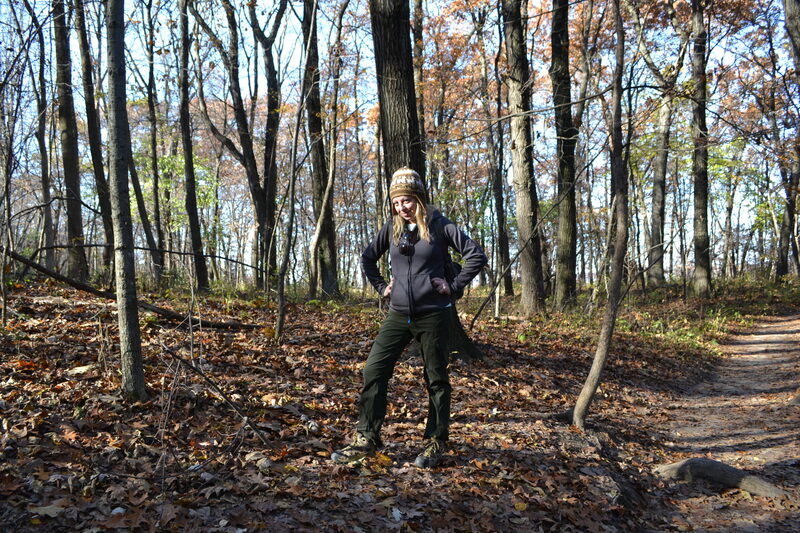 Hello,I read your blog named “Fall Colors Part 2: Starved Rock State Park | Agatha Kubalski” on a regular basis. Your humoristic style is bravo, keep doing what you`re doing! And you can check our website about 偷拍.